Published: Dec. 11, 2013 at 02:41 p.m. Updated: Dec. 11, 2013 at 04:19 p.m. 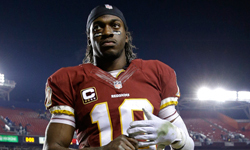 In a Wednesday news conference announcing a quarterback change, Washington Redskins coach Mike Shanahan consistently drove home the point that he would not have benched Robert Griffin III if owner Daniel Snyder and general manager Bruce Allen were not "100 percent" on board. Shanahan said he first broached the subject with Snyder and Allen before the 45-10 loss to the Chiefs in Week 14. » Instant Debate: Is this the right move? » Why was Griffin benched? » How will decision affect team? » What's behind the decision? Per Shanahan, the three of them decided the best course of action was to give Kirk Cousins an opportunity to play so Griffin could go into the offseason healthy. Griffin has taken more hits than any quarterback save Cam Newton this season. The coaching staff's concern was that those hits were "piling up" and "taking a toll." Because Griffin missed last offseason, Shanahan said he believes it would be "devastating" for the quarterback to suffer another injury -- even if RGIII "doesn't realize it at this time." "The chance of coming back (from another injury)," Shanahan added, "would be very, very tough." If that philosophy seems contradictory to the one that risked a torn ACL and LCL to the obviously gimpy Griffin in last year's playoff loss to the Seattle Seahawks, Shanahan said, "I could have kicked myself in the rear (for that decision) because ... my gut was I should have pulled him." In hindsight, Shanahan believes not sitting Griffin cost his team the game. It's fair to wonder why Shanahan wouldn't put other key players in bubble wrap for the last three games. His mindset is that it's "100 percent different" for quarterbacks because the offseason program is so much more integral for that position. We pointed out the peculiarity of Shanahan's stance after Monday's news conference. We're not alone in scratching our heads at the prospect of a healthy franchise signal-caller being banished to the bench. Éminence grise John Madden, a bipedal football history exhibit, told SiriusXM NFL Radio on Wednesday he's never heard of the "ridiculous" notion that a football player would be "shut down" when he's healthy enough to play. » Shanahan acknowledged that he hasn't talked to Snyder about other players because the owner couldn't "care less" about non-quarterbacks. "Hey, that's why you coach," Snyder told Shanahan. "That's why I own." » A suddenly transparent Shanahan described his approach thusly: "I'm trying to be as honest as I can, and I don't normally do that." » Shanahan conceded that he has questioned himself about rushing Griffin into the starting lineup for the season opener after missing the entirety of training camp and preseason action. "You can always go back," Shanahan added, "But doctors said he was 100 percent. Robert said he was 100 percent." » Regarding rampant speculation that he is goading the owner into letting him go, Shanahan said, "If I'm trying to get fired, I'm not going to call up Dan Snyder and ask his opinion on what I should do." Shanahan then quipped maybe "I'll get that 12-to-15-year contract." » Asked about the possibility of returning for the 2014 season, Shanahan replied, "That's Dan's decision at the end of this year. My job is to do the right thing for the organization." The latest "Around The League Podcast" recapped all the Week 14 games. "NFL Draft Buzz: Raiders planning surprise pic..."